Yesterday the Rt. Rev. 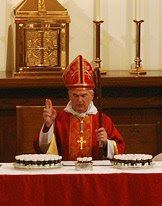 Jack Leo Iker, bishop of Fort Worth, celebrated the Chrism Mass with his clergy at St. Vincent's Cathedral. Below is the sermon the bishop preached. It is a fine statement of the responsibilities of the ordained ministers of the Church, especially in these trying times. ____________________________________________ In the name of the Father, and of the Son, and of the Holy Spirit. Amen. 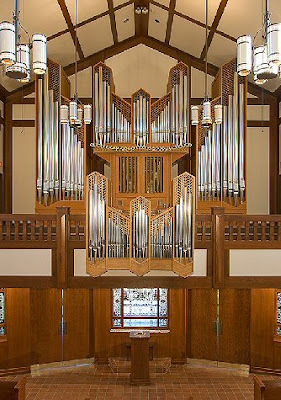 During the course of about eighteen years as a parish priest in the Diocese of Southwest Florida, I attended many ordinations, perhaps as many as four to six a year. And it was the custom in that diocese at the beginning of the service for the bishop to have a priest stand up and read to the congregation assembled the Preface to the Ordination Rites found on page 510 of the Prayer Book. (Don’t go looking for it now!) It was read as a way of stating before the service began what our church understood about what we were about to do in ordaining a deacon or a priest. It begins with these words, “The Holy Scriptures and the ancient Christian writers make it clear that from the apostle’s time, there have been different ministries within the Church. In particular, since the time of the New Testament, three distinct orders of ordained ministers have been characteristic of Christ’s holy Catholic Church.” And then it goes on to briefly summarize the essence of what a bishop is, what a priest is, and what a deacon is. Part of the awesomeness of this service today is that all three orders are present here at one time and place to renew and reaffirm the sacred vows which each of us took when we were ordained. And I want to simply begin with the reminder that the first theme of what we do today is “continuity and fidelity.” Continuity and fidelity. We promise to continue the apostolic ministry of Word and Sacrament as we have received it from the New Testament Church. We promise to be faithful to the doctrine, discipline and worship of Christ as this Church has received them. 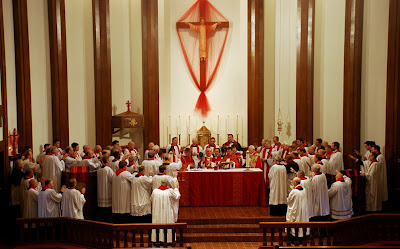 The Preface then goes on to state, “It is also recognized and affirmed that the three-fold ministry is not the exclusive property of this portion of Christ’s holy Catholic Church.” In other words, at each ordination we were reminded that neither the Episcopal Church, nor indeed the world-wide Anglican Communion, owns in any sense, or possesses in any sense these three-fold orders of ministry. We have received them from the apostolic Tradition of the catholic Church. They are not ours. That is to say, we cannot add to, nor can we subtract from, the giveness of the Apostolic Succession. We can’t vote in conventions to alter what we have received by the ordinance of Christ and the apostles. It belongs to Him, not to us. We can only continue in fidelity to that which we have received and assure that we hand it on intact, unchanged, undiminished, unblemished, to those who shall succeed us. It is an awesome thing and a great privilege, my brothers and sisters, to do what you and I are doing today. There is nothing “ho-hum” about it. It is an exciting and challenging time to serve as a bishop, or priest, or deacon in God’s Church today. But let us be very clear, we remain in continuity and fidelity first to the Scriptures, then to the Tradition. We endeavor to do nothing “new” or “innovative” or “creative,” so to speak, but we endeavor simply to pledge ourselves to do and to be what bishops, priests, and deacons have always done and always been. Part of this, of course, means that in each new age those who are called to the ordained ministry must be willing to discern God’s truth and hand at work in the world and in the Church of our time and place. And this has always meant that those who are ordained must be willing to confront and to refute those who would preach or teach anything at variance with the apostolic teaching and practice of the historic, undivided Church. In the Prayer Book tradition, as expressed in the 1928 version, the ordaining bishop urges the ordinand with these words: “to banish and drive away from the Church all erroneous and strange doctrines contrary to God’s Word.” We do not repeat these exact same words in the 1979 Book, but nonetheless, the obligation remains that we are to preach the truth, and guard orthodoxy, and defend the faith, and banish all strange and erroneous teaching from the Church of God, still today. If I were to ask the clergy here to name some of the Biblical sources for this threefold ministry, we would get various, different texts and passages quoted, because there are a number of passages in the New Testament that speak about these three-fold orders. There is the institution of the priesthood in John, chapter 20, when the risen Jesus comes to the disciples in the Upper Room and commissions them. He breathed on them and said, “Receive the Holy Spirit… Whose sins you forgive, they are forgiven. Whose sins you retain, they are retained.” He gives them the keys. And then there is the Great Commission, of course, at the conclusion of St. Matthew’s Gospel where the apostles are sent by the risen Jesus to go and make disciples: go baptize, go teach, and go and bring others into the fellowship of the Body. There is the ordination of the first deacons in Acts, chapter six, and, of course, the many references in Saint Paul’s ministry and writings to ordaining presbyters, or elders, in every town and place where he himself established a local church. Before he moved on the next place he commissioned someone to take charge of the life of the Church there. And, of course, there are many other passages we could cite. But it is in the apostolic age of the first successors to these earliest bishops, priests, and deacons of the New Testament that the three-fold ministry comes to be articulated and organized in a more formal way. The early Church Fathers expressed very much what is still today the practice of these three ministries in the contemporary Church. Foremost among these “early Christian writers” (as the Preface calls them) is St. Ignatius, who was the second bishop of Antioch in Syria, who was martyred in the year 115. Ignatius emphasized the importance, indeed the necessity, of following the teaching of only orthodox bishops, that the faithful not be deceived or led astray. For the bishop was to be the defender of the Faith, and you must expect from the bishop an exposition of the true doctrine of the Faith. Continuity and fidelity; orthodoxy and obedience. These four themes are central to our ordination vows, and they lie at the heart of the promises that you and I renew and reaffirm today. 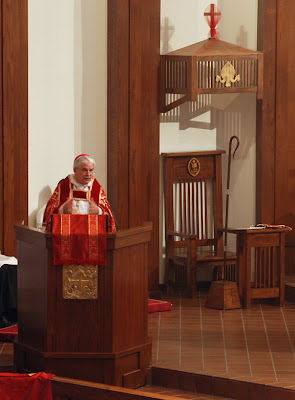 But, dear friends, you know as well as I do that we renew these sacred vows today at a time of great dissention and upheaval in the life of the Church, and especially that branch of the catholic Church where we have been called to serve and witness. Every week it grieves me that I receive unprecedented numbers of canonical notifications from other bishops informing me of priests and deacons who have resigned from the ordained ministry of the Episcopal Church, many of them known to me personally. But these resignations from the ordained ministry have been received, not because they no longer desire to serve as priests and deacons in Christ’s Church, but because as a matter of conscience they can no longer serve in the Episcopal Church. It grieves me that in recent days canonical actions have been uncanonically taken against some very orthodox, faithful bishops (four of them to date, but still counting.) And the charge that has been brought against these faithful, orthodox, godly bishops is the very curious one of having “abandoned the communion of this church.” Again, it must be said that these are not bishops who have renounced their orders. These are not bishops who have abandoned orthodoxy. These are not bishops who have denied the Faith. These are bishops who have made hard decisions about what they will and will not do in continuity and fidelity, in orthodoxy and obedience to their sacred call by God to serve as bishops in His Church. I honor them. In conclusion, none of us can say with any degree of certainty how all this is going to turn out, or when it will be resolved. But one thing is clear, my brothers and my sisters. By God’s grace today we stand, we make our stand, and we are willing to stand together, whatever the outcome or the cost. What we do today is to reaffirm our promises to be faithful, obedient, bishops, priests, and deacons, not in a denomination, not in a national church, not in a sect, but in Christ’s one, holy, Catholic, and apostolic Church. May God help us and defend us. “I believe because it is absurd.” Thus spoke Tertullian, a Christian theologian of the early third century. He was echoing the Apostle Paul’s remarks this evening. “The word of the cross is folly”, Paul says, “to those who are perishing.” To the wise men, the scribes, the debaters of this present age the events we commemorate this week make no sense. Admittedly, for those wedded to “the things of this world,” the mystery of the faith that you and I embrace is incomprehensible. Undoubtedly, the claim that a man rose from the dead after three days in the grave defies common sense. But the claim that the execution and resurrection of an itinerant rabbi in a Roman backwater almost two thousand years ago made a fundamental change in the way the entire universe works defies imagination. There may have been ten billion or so people who have ever walked the earth, but Christians assert that the Friday afternoon murder of this particular first-century Jewish man—Yeshua bar Yusef of Nazareth--at the hands of Roman thugs on a Judean hillside gained forgiveness of sins for all those who turn from their transgressions and put their trust in Him as Lord and Savior. And through the power of Christ’s resurrection our most implacable enemies, Death and the grave, have lost their sting. Sometime before dawn on Sunday morning a small stone chamber near the Place of the Skull became a second womb for the Source of Life Itself, and Christ won a victory that confers eternal life on those who put their faith in Him. All this was possible for this one man, Christians believe, because Jesus was more than a man. He was and is the Son of God Incarnate, the Source of all Being made Flesh, at once truly human and truly divine. We have been saved, my brothers and sisters, by nothing less than the Blood of God. This is “the message of the cross” to which Saint Paul referred, and it can be a hard pill to swallow. The human mind has a difficult enough time grasping the concepts of “perfect Justice” or “perfect Love,” without imagining them interacting with the decidedly imperfect world of our daily lives. That is why many of the world’s religions relegate their gods to the realm of mythology. The great works of the pagan gods usually take place in magical Never-Neverlands of long ago, not the same world that you and I inhabit. There are other faiths that conceive of the Divine as an abstract, monistic unity, reducing the world of space and time that we inhabit to mere illusion. But the Gospel of Jesus Christ is rooted in the intersection of the Divine with the human, the world of pure Spirit engaged with the world of flesh and bone. In the Incarnation, eternity stepped into time and the deeds of men coalesced with the will of God to become vehicles of our redemption. The acts of Christ that we celebrate this week are the saving acts of God in history, the Redeemer's re-sanctification of the day-to-day world that you and I inhabit. Holy Week is every bit as much about flesh and blood as it is about spirit. On Thursday night Jesus will break real bread and bless real wine and give it to His disciples, and it will become His very Flesh and Blood. On Friday Christ’s precious Body will be flayed with a cat-o-nine-tails and pierced by thorns and nails and a spear. His life-blood will soak into the splintered wood of a Roman cross and His breath will give out with a cry. His corpse will be wrapped in coarse linen and laid in a tomb with seventy-five pounds of aromatic aloes and myrrh. And finally on Easter Sunday, after the Lord of Creation has triumphed over Death by rising bodily from the grave--the very stones reverberating with the power of absolute Life--the risen Christ will go to the upper room, sit down again with His friends and enjoy a nice fish dinner! Make no mistake about it--we worship an embodied Savior, the One who "became flesh and dwelt among us." And when Christ redeemed us He redeemed the whole of us: body, soul and spirit. In a few moments He will offer us the whole of Himself, His Body, soul, spirit and divinity, in the Blessed Sacrament of the altar--just as He offered up the whole of His Being on Mt. Calvary. Our response to Christ's self-giving love must be bodily as well as spiritual. In the words of the letter to the Hebrews "let us also lay aside every weight, and sin which clings so closely, and let us run with perseverance the race that is set before us." May God grant us the grace to respond to Christ’s gift of life with renewed devotion and an unshakeable faith.